Well it is official, I am officially a Number 1, Amazon Best Selling Author we have made it to the number one spot in the highly competitive marketing category on amazon.com and number two on amazon.co.uk in two categories, Computing and Marketing & Sales. 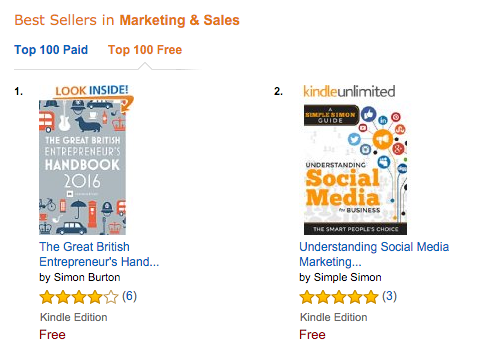 Now, whilst I am excited at getting to the top of the amazon kindle store. After all I think it is quite an achievement, it is in the free section and, of course I am happy to be there and quite proud of the performance so far, the key is whether the book continues to sell once it is in the paid section. After all, if I don’t earn any money from it then I may be able to boast that I am a number one best selling author but, I will be a poor amazon best selling author. I also do not know how long it will last? The reason for all of this hard work and effort to promote the book is to hopefully get it noticed and ranking hight enough that it starts to gain traction in the ‘paid for’ for section. 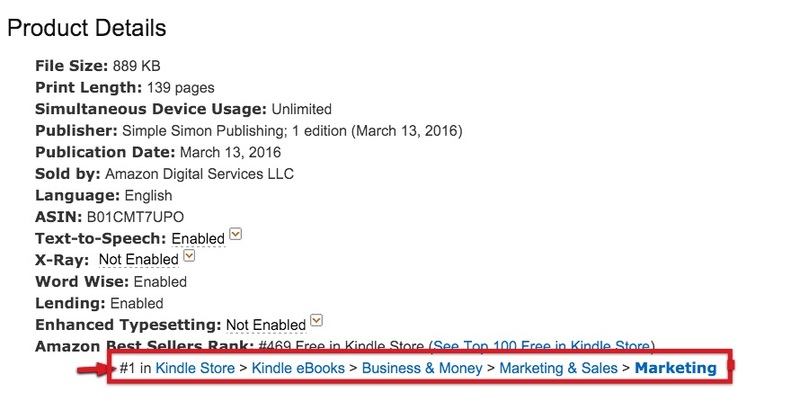 If I can then get to number one in the paid section than it should be generating an income of some kind. I have yet to work out how much a book like Understanding Social Media For Business will earn if it ranks high in a number of the categories but, rest assured I will share it with you once it starts to generate fully paid up sales. It has taken a lot of work in the past couple of weeks and, I am sure that it will get easier the next time, and the time after that. The reason I say that it is that I have used a variety of different marketing methods to try and get the book out there. Some of these methods may turn out to be a total waste of time but I thought that it best if I tried everything that I could to see which methods had the most effect on driving sales. The only problem with that, is that I have not setup proper funnel for the book or analytics on the site (I know, I know, before you say anything) Also, amazon does not give you the data so it is guesswork as to which method worked. I will do my best to be more methodical in my approach with the next one as the scatter gun approach is not the best way to keep my sanity. The day I published the book I sent out an email and posted it on facebook to my personal page and a few of the FB groups that I am in. It was priced at $7.99 (£5.62) I was surprised to see that I got a few sales as I had made it clear in the email and post that I would be running a FREE promotion in a week or so. I do not know whether it was my friends or colleagues on the FB groups that paid for it, although I am grateful for it. I was not expecting anything just yet. The idea is that if the book gets enough downloads and positive reviews, then it will give it traction in the amazon rankings and help to increase sales of the book. There are probably a lot more things that go into the way that they rank the books, like the keywords, title and description but the above 3 things are what I am trying to influence. So far I have had over 344 downloads as of Saturday morning (16th April) and I am hoping that this doubles over the weekend. 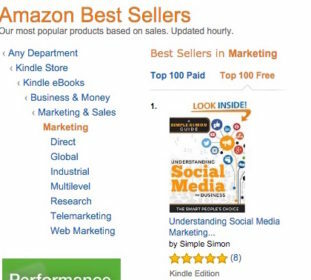 This has helped get us to the number one spot in the kindle store for free books in the marketing category on amazon.com and the number 2 spot on amazon.co.uk in two categories Computing!! and Sales and Marketing. Whether the downloads will keep me in a reasonable position or not I have yet to discover. Hopefully, the book will remain somewhere towards the top and will then begin to get more sales which in turn will keep it at the top. Well thats the plan anyway! The average pages read by people who have downloaded it via kindle select, so far 44 (out of 139) which is not bad although I hope that increases over the next few days as I do not think people will read it in one sitting. Also, it is a book that can be read in any order and used as a reference book so this might mean, that in the long term, I do not get people reading the whole book from start to finish but we will see. From what I have read and understood, the amazon select program works by combining all of the income derived from amazon select and dividing it up between all of the books in the program (authors can choose to enroll in amazon select program or not) and shared out pro-rata. The more of the book that is read the higher % you receive. Recently, people have been caught gaming the system by tricking people to click on a link which takes them to the end of the book therefore making it look like the reader has read 100% and then the author has then been receiving higher payouts. Amazon have been stamping down on this practise and removing books and closing some accounts of those that have been using this and other tactics to fiddle the system. The reviews should help to consolidate the rankings over time. A few people wrote reviews from a pdf copy that I sent to them and I do not think that amazon will value these reviews anywhere near as much as those that are from verified buyers. I have yet to discover whether there is even more value in a review from someone that pays for the book rather than downloading the book during a free promotion? There are a lot of things to test yet like price for example and I will be making changes over the coming weeks to see how we do. I also hope that the promotion will help me generate proper sales and, if so then I will be running another KDP select free promotion. I have another 2 days left. You can do 5 days free promotion in a 90 day period on kindle select. I am also working on the cover for the paperback version which I hope to get done in the next few days. I am going to write a new post in the next few days that explains what I did to get my book ranking and will also publish the other numbers like downloads and sales over the coming weeks so you can follow my journey and maybe learn from my experiences good and bad. I have submitted the book to a number of websites that publish free promotions as well as posted to my facebook groups. I will explain all of the steps and provide a list of the websites and groups that I posted to as well as answer any questions that you guys might have.